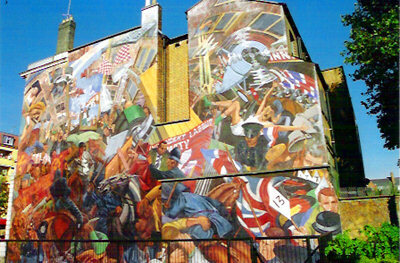 One of the best loved anti-fascist murals in London. 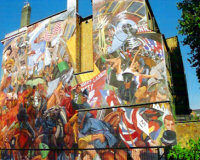 Description: The Cable Street mural was painted to celebrate the victory against fascism and the Blackshirts on 4th October 1936. The mural was planned in 1979 and took a year to design and paint, it was completed in 1981. The mural was painted by Ray Walker, Paul Butler and Desmond Rochfort. Dave Binnington had originally planned and researched it but quit after the his early work was destroyed vandals. 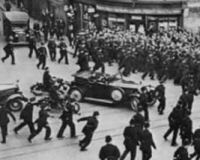 When they were planning the design for the mural the artists carried out historical research into the events that took place at the battle of Cable Street by looking at books, photographs and films about the event. It's on the side of St. George's Hall. It was here that Oswald Moselys fascist march was stopped.